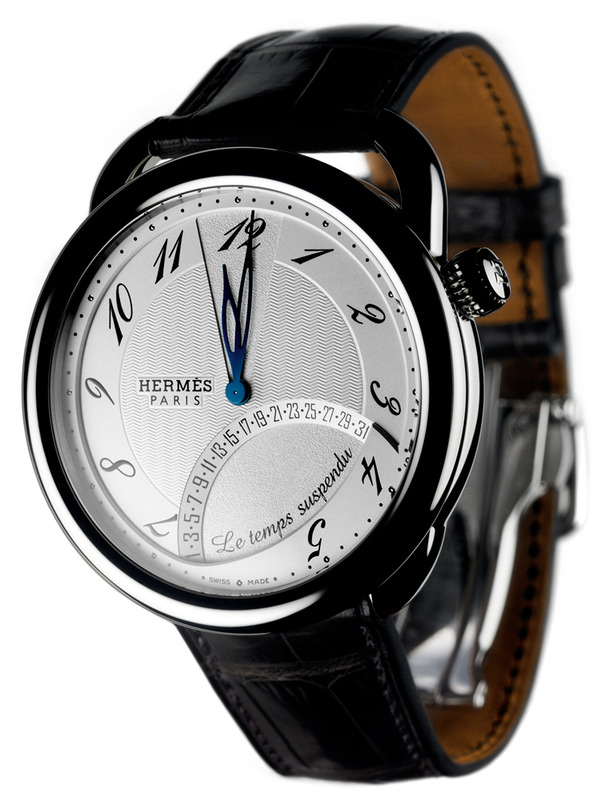 Hermès is not normally my first (or even tenth) port of horological call, but the announcement at Baselworld 2011 of the Arceau Le Temps Suspendu grabbed my attention for its whimsy. 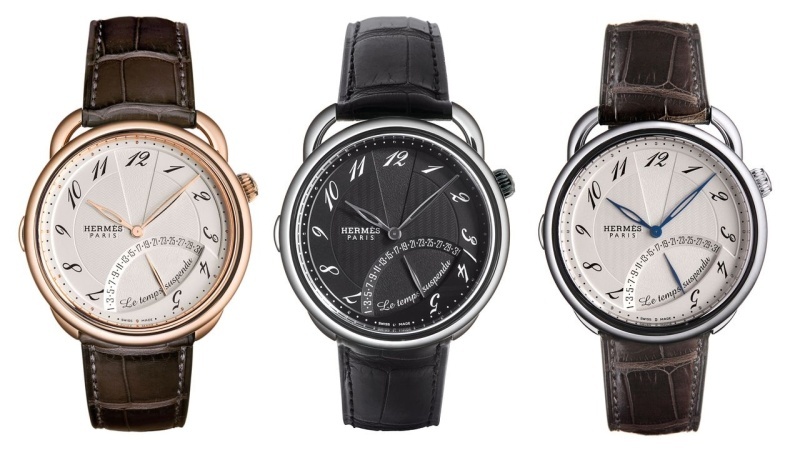 With Les Temps Suspendu, Hermès’ Arceau watch, created in 1978 by Henri d’Origny, has been horologically upgraded by the brand’s partnership with Agenhor and its founder Jean-Marc Wiederrecht, most well known for the MB&F HM2, Harry Winston’s Opus 9, Van Cleef & Arpels Pont-des-Amoureux, and the True North for Arnold & Son. The name means “suspended time”, and this retrograde complication is demonstrated through the pressing of a pusher at 9-o’clock which ‘suspends time’ by bringing both the hour and minute hands to the recessed area at 12 o’clock, hiding the retrograde date hand in the process. Despite appearances however, the movement continues running and keeping time. If you press the pusher again, the hands will then fly back to the correct position as at that moment. Interestingly, the hands may stay suspended for hours, days or even weeks, but so long as the movement is wound, the watch keeps on ticking. Its triple retrograde system is protected by two patents. Functions Triple retrograde of hours, minutes and date. Stop/ start pusher for hands. Case 43mm. 18K rose gold or stainless steel. 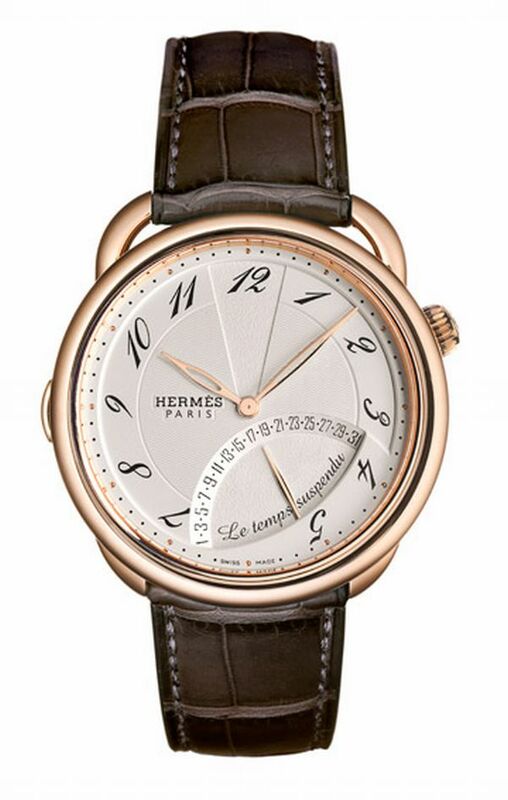 Rose gold is limited to 174 pieces. The case and the overall ‘look’ of this watch are obviously not new, so any appeal likes in the originality of the retrogrades and the ‘suspension of time’. It strikes me as a novelty that will people will simply either like, or not, but no doubt it will provide the wearer with amusement playing around with the pusher. I like this ‘suspension’ retrograde function, it’s lighthearted and playful. It is not an unattractive watch, and the partnership with Agenhor will no doubt give some horological gravitas, but it strikes me that perhaps it would have been more interesting if this innovation had been cased in something new and special to it, rather than to re-use an existing model. The case, lugs and dial design of the Arceau are classic and don’t date, but maybe a novel idea like this deserves a more novel exterior.